Osowski, Valerie. The PERM Paradigm: Relationships Matter. MSU AgBioResearch, Futures Magazine, Michigan State University. Spring/Summer 2011 issue. For 18 years, the Partnership for Ecosystem Research and Management (PERM) has successfully brought together university scientists and state and federal agencies to solve problems and apply research results to keep the region's natural resources base healthy and sustainable. 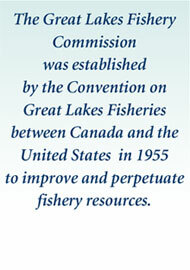 Initiated by Michigan State University (MSU) AgBioResearch scientist Dr. Bill Taylor (professor of fisheries and wildlife, university distinguished professor in global fisheries systems, and commissioner for the Great Lakes Fishery Commission) and Michigan Department of Natural Resources (DNR) Fisheries Chief John Robertson (now retired), the PERM agreement was formalized on Earth Day, April 23, 1993. As the benefits of the enterprise became quickly realized, the partnership expanded to include the DNR Forest Management Division in 1995 and the Great Lakes Fishery Commission (commission) and the U.S. Geological Survey's Great Lakes Science Center (center) in 1997. "In the 1990s, natural resources issues were becoming more complex," said Dr. Bill Taylor, at MSU. "There were new issues such as sea lamprey control and fish population dynamics that needed to be looked at from a systems level rather than at a species level. We needed an integrated, cooperative approach if we were going to tackle these challenges." Robertson agreed: "We were hurting a great deal for research. The DNR had a fundamental research program that looked at key parameters but didn't consider the relationships between systems." Taylor summarized the goal of the PERM program: "The idea was to merge the best of what MSU could offer from a scientific point of view and to deliver it directly to natural resource agencies for a quicker application to management problems." Another PERM partner, the U.S. Geological Survey Great Lakes Science Center (GLSC), fulfills a key role in contributing to the success of this unique research-oriented collaboration. "We are unique among the four partners because our participation in PERM is providing access to our Hammond Bay Research Facility in northeastern Michigan, where we conduct international sea lamprey research with MSU, the DNR, and the GLFC," explained GLSC director Russ Strach. "There's just no way for each agency to replicate these types of facilities, and there's no need to because, under an agreement like PERM, we're able to make them available to the cooperating parties," Strach said. Despite the pressures of tough economic times and the ups and downs inherent in any long-tem relationship, all of the partners see PERM continuing to grow and evolve to grow and evolve in beneficial ways. "The people we've hired have been outstanding," Taylor said. "They're bright individuals who are competitive world-wide for grants and have raised our program stature. They're also giving skills to our students – skills that no one else has." The GLFC supports three PERM scientists at MSU: Dr. Weiming Li, Dr. Michael Wagner, and Dr. Michael Jones. Given the success of the PERM agreement at MSU, the commission, in 2001, initiated a PERM program with the University of Guelph and supports one scientist, Dr. Rob McLaughlin. The research efforts of these scientists are augmented by undergraduate and graduate students, postdoctoral fellows and other faculty members. In just the past ten years, this partnership has resulted 50 commission-sponsored research projects and nearly 100 scientific publications. "The PERM program helps the commission conduct and communicate about our research and is a central means by which we fulfill our duties as defined by the convention, so it plays a critically important role for us," said GLFC science director Charles Krueger. "We provide research direction for projects of interest to us and have research boards that make recommendations about GLFC priorities. PERM scientists typically are members of these boards, so they play an integral role in deciding which research projects we fund and the research directions we pursue." developing a better understanding of fish community and population dynamics. These initiatives are carried out under the commission's Science Transfer Research Program. Dr. Jones also serves as the liaison with the key provincial, state, federal, and tribal partners through the Council of Lake Committees. Drs. Li and Wagner are exploring the potential to enhance sea lamprey control efforts through natural means. Li led groundbreaking research that identified the pheromone that male lampreys use to attract females to their nests to mate. Meanwhile, Wagner is working with natural chemical communication signals that could potentially be used to repel lampreys in search of good spawning habitat. These compounds, know as alarm substances, are released from decaying sea lampreys, alerting the animals that the area they are approaching is likely a dangerous and an undesirable place to deposit future offspring. "The commission considers regulating spawning and migratory behavior with pheromones the most promising control method for implementation, so we're excited about the possibilities," Li explained. For more information about this research, see the eForum article, Understanding Sea Lamprey: Mapping the Genome and Identifying Pheromones, located here: http://www.glfc.org/eforum/article1.html. Dr. McLaughlin, PERM scientist at the University of Guelph studies the behavioural ecology of fishes and is investigating the effect of sea lamprey barriers on fish biodiversity, how to improve sea lamprey trapping, and how to facilitate fish passage while preventing the spread of sea lamprey. As barriers and trapping are critical components of the comprehensive control strategy, improving these techniques is vitally important to the program. Krueger added that PERM is an excellent strategy for getting research done. "We see this as an extremely productive, valuable program," he said. "It is foundational to complementing our research mission. Through the PERM agreement – and several other research partnerships – we can nimbly go back and forth and get all sorts of things done using these different organizational research strategies than if we were simply operating with a narrow, one-agency research program." 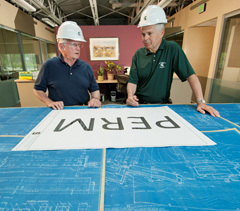 Former DNR Fisheries Division chief John Robertson (left) and AgBioResearch scientist Bill Taylor (right) teamed up to create the innovative PERM agreement to narrow the gap between research and implementation. Hammond Bay Biological Station is located on Lake Huron in Rogers City, Michigan. Native to the Atlantic Ocean, the parasitic sea lamprey was accidentally introduced into the Great Lakes during the past century. 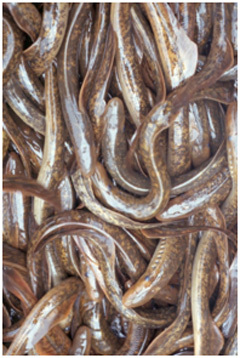 One sea lamprey can kill 40 or more pounds of fish, and only one of seven fish attacked by a sea lamprey will survive.